The Anchorage Chamber is Hiring! Anchorage Chamber of Commerce has an opening for an Event Coordinator. They are seeking candidates with a passion for the mission of the Anchorage Chamber. Candidates must possess a proven record of exceptional time-management, organizational and multi-tasking skills. The responsibilities of this position require a self-starter who can work independently and equally important, must be work well and efficiently with staff and volunteers. This position has the flexibility to be active in promotion of events and experience with social media such as Facebook, Twitter and Instagram is required. ACS scholarships are made possible by passionate community members committed to helping Alaskans pursue their educational dreams. Each of our scholarships have specific criteria, deadlines and requirements. GVEA awards eight (8) scholarships each year. The first seven are awarded in April, and the eighth is awarded in August. To be eligible for any GVEA scholarship, the applicant (or member of the applicant’s immediate family) must be a member of Golden Valley Electric Association and receive electric power from GVEA at his/her principal residence. The new BP scholarship program is now open for students to apply. Every student veteran across the country currently enrolled in a four-year institution is eligible for at least one of the scholarships being offered. Fog Woman Coffee is offering a $1500.00 higher education scholarship for all Alaska Natives students. Students must be enrolled at least part-time and show proof of AK native ancestry. The Merchants Exchange Scholarship is designed for students in Maritime Biology and Maritime Science programs, and awards up to $2,000 annually to students in Maritime and/or International Business/Trade programs. The Spring 2016 General Scholarship Award opportunity is now available and accepting student applications through April 15, 2016 with a scholarship to be awarded in the amount of$1500 USD. Scholarships are open to any student wishing to further their education at the university/college level, in Washington or Alaska, majoring in the area of Visual Arts. Although need and merit will be considered, 70% of our selection criteria is based on talent and potential in the art area. So, creativity is highly encouraged! At our 2015 annual membership meeting, Helena Jacobs was elected to the Doyon Foundation board of directors for a three-year term. Incumbent Julie Anderson was also re-elected for a two-year term, and incumbent Joshua Peter was re-elected for a three-year term. Helena Jacobs is the Foundation’s newest board member. The Foundation is pleased to welcome Jacobs, who is the daughter of Dee Olin and David Hoffman. Her maternal grandparents are the late Lillian and Fred Olin, and her adopted maternal grandparents are Lorraine and the late John Honea. Her roots are in Ruby, but she grew up throughout Alaska and currently resides in Anchorage with her husband, Torin, and their children. The Foundation supported Jacobs in obtaining her bachelor’s degrees in anthropology and Spanish from Willamette University, and her master’s in public policy from University of California Berkeley. Her professional background has focused on promoting educational advancement, career readiness, capacity building and leadership development. She currently runs her own small business, Benozaadleyo Consulting, providing professional support to nonprofit and government agencies statewide. “I benefited greatly from the programs the Foundation runs, and I feel called to give back. It is an honor to serve in a capacity that would allow me to support other Alaska Native students, and offer what I have to the organization that helped me so much,” she said. 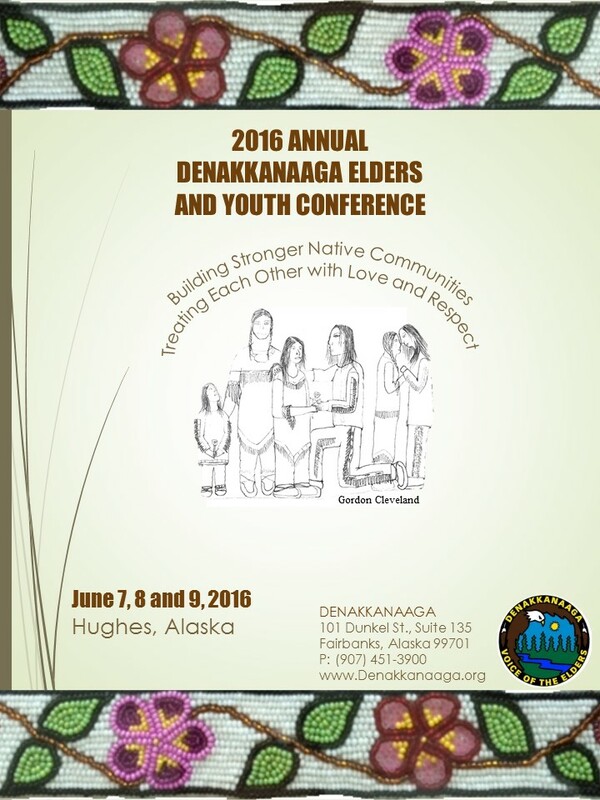 Denakkanaaga is pleased to announce the dates and theme for its 2016 elders and youth conference. The theme of this year’s conference is “Building Stronger Native Communities- Treating Each Other with Love and Respect.” The logo was drawn by Gordon Cleveland of Hughes. The conference will be held on June 7,8 and 9th in Hughes, Alaska, with June 6 and 10 being travel days. More information on the conference will be made available in late March. The Associated General Contractors of Alaska, Inc. (AGC of Alaska) & Construction Education Foundation, Inc. (CEF) scholarship program is intended for students who wish to pursue a career in the construction industry or related fields such as accounting, insurance & bonding, or human resources. Scholarships will only be awarded to individuals who plan to live and work in the state of Alaska. Complete the online application at http://www.agcak.org/agc–construction-education-foundation-scholarships.html.